Player Killers: what college programs are known for hurting pro prospects? Player Killers. Arm Shredders. Arm Abusers. There’s more than a few college coaches/programs out there who are known for it. Its always dangerous to make a blanket statement in baseball. If I say that “CollegeX is known for killing pitcher arms” then there’ll immediately be people who cite players who are exceptions to such a rule. Nonetheless, while reading a ton of prospect-driven content on the web over the years, some common themes pop up. And the crux of it is this: there are some college baseball programs out there that are accused of hurting their players’ professional prospects and draft statuses by virtue of the misguided or (in some cases) outdated coaching and usage of players. Grantland’s Michael Baumann wrote an excellent article summarizing some of the “danger programs” in 2013, citing work done by Rany Jazayerli and Baseball Prospectus. Some of this also comes from Keith Law‘s freely offered opinions on the topic, and he offers up plenty of supporting evidence in his columns and chats. Some of these are “arm shredder” programs, others are places that are thought to change player’s swings. Stanford: Law calls it the “Stanford Swing.” Per Law, Stanford coaches emphasize going away, altering hitters’ swings to de-emphasize pull hitting, to the point apparently where players are outright benched for pulling the ball. Now, there’s quite a few Stanford grads in the Majors right now, and the hitters listed aren’t exactly an honor roll of top-hitting guys. Jed Lowrie might be the best active hitter. The career Stanford grad homer leader is the recently retired Carlos Quentin, out of baseball at 32. So maybe there’s something to it. 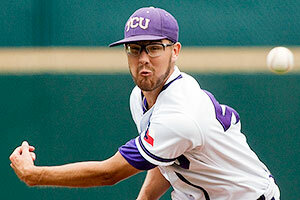 TCU: Jim Schlossnagle is not well known for its handling of pitchers. The Nats are well aware of this, having drafted damaged goods in Matthew Purke, who was 15-0 as a freshman and basically hasn’t been the same since. Rice’s Wayne Graham: Law has provided an exhaustive list of pitchers who he accuses the Rice coaches of blatantly over-working and has flat out suggested that pitchers considering attending Rice should go elsewhere. In fact, the most blatant example of this was the 2004 draft: Rice had three starters drafted in the first 8 picks (Philip Humber, Jeff Niemann, and Wade Townsend) and ALL three of them suffered shoulder injuries soon there after. UNC‘s Mike Fox so over-used a reliever a few years back that the New York Times of all papers wrote about it. And he had Matt Harvey, don’t forget, allowing Harvey to throw an astounding 157 pitches in a 2010 outing and 5 other instances of 120+ pitches. Is it a coincidence that Harvey blew out his UCL just a couple years later? Causation or Correlation? South Carolina‘s Ray Tanner: won back to back CWS’s … on the backs of his pitching staff. Texas‘ legendary coach Augie Garrido already had a reputation for overuse before the infamous Texas-Boston College regional game in June of 2009. Texas’ Austin Wood, a reliever, came out of the bullpen to throw 13 innings and 169 pitches in the 25-inning game. Garrido really took a lot of heat for that … but his BC counterpart might have only been slightly less culpable. BC threw its own guy Mike Belfiore for 129 pitches and 9 2/3 innings. In Wood’s case, it was made even worse by the fact that he had thrown two innings *the day before. * It is no surprise to report that Wood had to undergo Shoulder Surgery the next season, nor is it a surprise that the crusty Garrido disclaimed any responsibility for the injury by Wood’s usage in that game. Belfiore, it should be noted, has never shown any evidence of injury, was a 1st round draft pick just prior to his appearance, and looks like a 4-A pitcher who is now in the Detroit organization but who had a cup of coffee in 2013. Perhaps its because Belfiore was a starter and basically threw a start instead of Wood, who was clearly a reliever. UCLA: Look at the usage in college for guys like Trevor Bauer and Canning Griffith; is it any shock that these guys end up with injuries? Notre Dame: Not a good track record (per Keith Law) of developing or protecting pitchers. Pitch count guidelines: there’s research out there that basically shows that anything above 120 pitches in an outing is an indicator of fatigue-induced regression their next time out, and 130+ pitch outings might as well be prescriptions for injury. Times have changed: no longer are A-1 pitching prospects left in games to rack up ridiculous pitch counts. Mark Prior had at least 6 starts the year he was drafted where he threw 120-130+ pitches. Ben McDonald was famously started in back to back CWS games, getting clobbered in the second game … all while having *already* been drafted by the Baltimore Orioles, who must have been screaming at the television set watching what was unfolding as legendary LSU coach Skip Bertman set about destroying the best arm in the nation. But then again, the more things change, the more they stay the same. NC State, in a mad dash to make the post-season in 2014, let their Ace starter Carlos Rodon throw 120+ pitches seven times. Rodon’s usage was also discussed in Baseball America. Did that lead to Rodon’s diminished stuff and subsequent drop in the 2013 draft? Maybe. I’m sure the White Sox are ok with it, since he doesn’t seem to have suffered any ill effects and is in their rotation 2 years later. Trevor Bauer, while at UCLA, *averaged* more than 120 pitches an outing the year he was drafted … but he seems like such an outlier because of his warm-up technique (which involves extreme long toss and clearly has built up his shoulder strength over the years). Are NC State and UCLA trouble-programs? I havn’t heard much since so i’m leaving them off for now. Conner Jones: 1st round talent out of HS, slipped to 2nd round in 2016 thanks to regression during college career but no injury issues thus far in pro career. Nathan Kirby: supp-1st rounder in 2015: after just 5 pro games he needed Tommy John. Missed all of 2016 with injury, still not on an active roster as of Apr 2017. Josh Sborz; supp-2nd rounder in 2015: 2016 High-A all-star and 2017 NRI to Dodgers MLB camp. Starting in AA. One minor D/L trip. Was UVA’s closer/long reliever but starting in pro ball. Brandon Waddell: 5th rounder in 2015: quickly pitched his way to AA, where he spent most of 2016, suffered a forearm strain early in 2017. Nick Howard: 1st rounder in 2014, missed half of 2015 and 2016 with shoulder injuries, still in XST to start 2017. Artie Lewicki: 8th rounder/senior sign in 2014: missed parts of 2014 and 2016 on the D/L but active and in AA in 2017. Whit Mayberry: 21st rounder in 2014, already released by his drafting team (Detroit) and signed as a MLFA by Washington for 2017; currently in High-A. No injuries. Kyle Crockett: 4th rounder in 2013, raced through the majors and debuted for Cleveland in May 2014. No injuries. Scott Silverstein: 25th rounder in 2013, hurt in May 2015 and released after that season. Branden Kline: 2nd rounder in 2012, has been on the D/L since May of 2015. Danny Hultzen: #2 overall pick in 2011: massive shoulder issues, out of the game after throwing just 169 minor league innings in 6 pro seasons. Will Roberts: 5th rounder in 2011, has had a long minor league career; in AAA to start 2017. Tyler Wilson, 10th rounder in 2011, is currently Baltimore’s #5 starter. So a couple of high profile injuries, but also some successes. I suppose the issues that their marquee 1st rounders has led to this reputation. UConn getting a bad rap. 2015 CWS Finals: Virginia wins! In Game One on 6/22/15, UVA’s Connor Jones matched Vanderbilt’s ace Carson Fulmer zero for zero for the first five innings. However, Vanderbilt got a well-timed opposite field double down the line to plate two and then scored three more, knocking Jones from the game in the 7th to win game one 5-1. Fulmer was outstanding, holding UVA to just 2 hits through 7 2/3rds innings, leaving with a large lead in his final collegate appearance (he was drafted 8th overall by the White Sox). Other players of note: #1 overall pick Dansby Swanson finally had a good game, going 2-4 with a run and an RBI. Nats 3rd rounder Rhett Wiseman struggled; going 0-4 with the hat-track of three punch-outs. In Game Two on 6/23/15, UVA turned to their regular outfielder Adam Haseley in somewhat of a shock, and he threw 5 shut-out innings before handing the ball to the most dominant pitcher this post-season has seen in Josh Sborz, who threw another 4 shutout innings to shore up the win 3-0 and force a game 3. UVA’s offense was also unexpected; they were powered by their #8 and #9 hitters, the latter of which was walk-on senior Thomas Woodruff, who had a grand total of 67 ABs in his collegiate career. It was Woodruff’s 2-run bases loaded single that provided the game winning runs. Amazing. In Game three on 6/24/15, UVA’s Brandon Waddell threw the game of his life, giving up 2 runs early but then shutting down Vanderbilt’s offense for the next six innings en route to a 4-2 win. Vanderbilt’s Walker Buehler struggled with his control, giving up runs early and getting unceremoniously yanked in his last collegiate appearance. Nathan Kirby came on to relieve Waddell, who threw 105 pitches on 3 days rest, and blew away Vanderbilt’s hitters in the 8th and 9th for his first (and last) career save. 3B Kenny Towns, a lowly 20th round pick by the Angels, was the game hero, with a very good diving stop to save a run early and a crucial go-ahead RBI late. But it was freshman 1B Pavin Smith who was the offensive star of the game, clubbing a 2-run homer early to tie the game and deflate Vanderbilt. UVA wins the first Baseball title for the ACC since 1955, an amazing stat considering the baseball-playing pedigree of the conference. Super reliever Josh Sborz recieved the MVP award for his CWS work; final tally: 3IP on 6/13, 2IP on 6/15, and 4ip on 6/20, and 4IP on 6/23. All Scoreless. UVA completes a pretty amazing season all things considered; they suffered injuries to a number of their key guys, struggled in conference all season and likely only even made the field by virtue of a sweep of UNC in their final ACC season series. But, for those who thought the final was a fluke based on the seedings of the two teams, consider this: Vanderbilt was the consensus pre-season #1 team by every poll out there, and UVA was either 2nd, 3rd or 4th in those same polls. So these teams were expected to return to the CWS at the very least … they just to circuitous paths there. This concludes the College Baseball season and our coverage of it for 2015. I have some draft posts about summer leagues and summer travel teams of note for high schoolers that I may dig out again, for those interested. My pre-CWS predictions were Florida from the top and LSU from the bottom. Lets see how things turned out. In the opening games, UVA took out Arkansas 5-3 behind a decent effort from Connor Jones (Great Bridge HS) but an even better effort from 2nd rounder Josh Sborz, who shut down Arkansas for the win. Both teams’ premier hitters (Andrew Benintendi and Joe McCarthy) hit solo shots during the game. In the other opener, Florida destroyed Miami 15-3, knocking out Andrew Suarez after just 3 1/3 innings. In the first elimination game, Miami got two hits in the bottom of the 9th to walk off and eliminate Arkansas 4-3. In the winners bracket game to take control of the group, UVA’s #2 Brandon Waddell pitched perhaps the game of his career, shutting down Florida on just 2 hits for 7 scoreless innings before Sborz got the 2-inning save, giving UVA a 1-0 victory and a surprising (to me) clear path to the CWS finals for the 2nd year in a row. In the play-in game to the group final, Florida jumped all over Miami’s starter, so they brought back Suarez on short rest (which I’m sure his drafting team (San Francisco) was thrilled about), but the game was over early and Florida eliminated Miami 10-2 to setup a rematch with UVA for a berth in the finals. In the group final, UVA’s gambit of throwing ace Nathan Kirby after being side-lined for months backfired; he was hit hard early and UVA’s notional 3rd starters (Alec Bettinger) just couldn’t keep Florida at bay long enough to allow his offense to come back. Florida wins 10-5 to force a winner-take-all game and wreak havoc on UVA’s pitching matchup strategy. 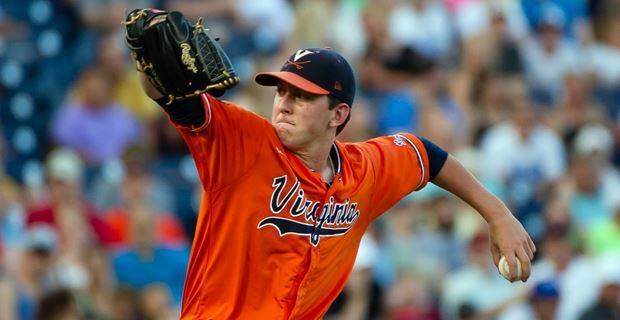 Luckily for UVA, they have Josh Sborz, who relieved Waddell and threw four shut-out innings, enough to give UVA’s offense time to scrape together the winning run and advance to the CWS final. In the opening games, TCU stunned LSU 10-3, with TCU’s ace (and Chicago Cub 8th rounder) Preston Morrison shutting down LSU’s offense. Nats 2nd rounder Andrew Stevenson was 1-4 with an RBI. Meanwhile, Cal State – Fullerton got to Vanderbilt ace Carson Fulmer while their own ace (2nd round pick Thomas Eshelman) showed why he’s got 80 command, throwing 5+ scoreless, walk-less innings before weather forced the suspension of the opener. Luckily for Vanderbilt, the rest of CSF’s staff wasn’t as effective, and Vanderbilt got a 4-3 walk-off win. In the first elimination game, LSU’s Alex Lange pitched a complete game to defeat Cal State-Fullerton and eliminate them from the CWS. In the winners bracket game to take control of the group, Vanderbilt’s clean-up hitter Zander Weil hit a solo homer in the 7th to provide the only offense of the night as Vanderbilt beat TCU 1-0 to take control of the group and make it seem more and more likely of a CWS rematch. In the play-in game to the group final, TCU punished LSU’s bullpen and took an easy 8-4 win to eliminate the highest seed in the CWS and force a rematch with Vanderbilt for a spot in the CWS final. In the group final, Vanderbilt threw their 1st rounder Walker Buehler for the first time in 3 weeks and he was sparkling; he pitched into the 7th, allowing just 4 hits. Meanwhile Nats 3rd round pick Rhett Wiseman, after taking a ball to the neck in the 1st, absolutely crushed a homer to put the game out of reach for Vanderbilt, who go on to win 7-1 and advance. Group winner advancing to the CWS finals: #11 seed Vanderbilt. Ace Fulmer threw 6 innings and 104pitches on 6/14/15. He’ll be on 7 days rest for game 1. #3 Philip Pfeifer threw 7 innings and 112 pitches on 6/16/15. He’ll be on 6 days rest for game 2. #2 Buehler, who threw 6 2/3rds innings on 6/19/15 would be on 4 days rest for a decider on 6/24/15, normal rest for a pro but a little short for a college guy. Otherwise, some-time starter John Kilichowski, who threw 2+ in both the 2nd and 3rd games of the CWS group play, could be available depending his usage in the first two games. Connor Jones threw 6ip and 96 pitches on 6/13. He’d be on 8 days rest for 6/22. Kirby threw 2 2/3rds innings and 54 pitches on 6/19. He’d be on 3 days rest for a 6/23 start. Waddell threw 5 innings and 87 pitches on 6/20. He’d also be on 3 days rest for a potential 6/24 start. Sborz meanwhile threw multiple innings in each group win: 3IP on 6/13, 2IP on 6/15, and 4ip on 6/20. And all of those were very high leverage innings, with UVA either tied or clinging to a small lead. UVA almost has to consider throwing one of its mid-week starters in Game 2. That would give them Kirby on 4 days rest in the final, to be relieved by Waddell on 3 days rest. You just can’t take a guy who hasn’t thrown in months and then pitch him back to back on the shortest rest of his life. You have to like the way the CWS lines up for Vanderbilt’s staff. Jones wasn’t exactly overpowering against Arkansas in his start (3 runs in 6ip) and Vanderbilt’s got a better offense. I’m note quite sure how Vanderbilt slipped to an #11 seed in this tournament, given the talent and leadership on their squad. It is worth noting they had no less than nine draftees in the 2015 draft; 3 first rounders (1st, 8th and 24th overall), 2 third rounders and a 6th of note. That’s a ton of talent. You have to think they’re the favorites in the final to repeat. 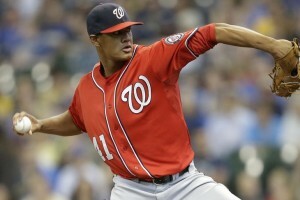 Is Ross making the Nats re-think their future rotation strategy? Joe Ross, who it is fair to say was in some respects the “other guy” in the Tampa/San Diego 3-way trade that netted the Nats presumed future shortstop Trea Turner but cost them Steven Souza and prospect Travis Ott, got a somewhat surprising call-up after the starters covering for Doug Fister didn’t quite give the Nats the performance they were looking for. Three starts later, two of which were easily defined as “dominant,” is it too soon to think that perhaps Ross is a bigger part of the Nats future than the trio of starter prospects we have stashed in Syracuse? He looked *really good* last night against a team on an 8-game winning streak. He was making professional hitters look very, very ordinary with his slider. His slider was so good, he threw it nearly 50% of the time last night and got an astounding 38% whiff rate. Average fastball of 93.1, max of 96.8 on the night. Wow. Small Sample Sizes, of course. And maybe you could ignore the 11-K performance against the god-awful Brewers. But Pittsburgh is was hottest team in the league and was mowed down like little leaguers. 2016: Scherzer, Strasburg, Gonzalez, Roark and a battle between Treinen, Cole, Jordan and Hill (in that order) for 5th and 6th spots. 2017: Scherzer, Giolito, Gonzalez, Roark, and a question mark. Maybe Treinen/Cole, maybe a veteran acquired via FA or trade. Maybe Lopez if he moves up at the same pace as Giolito. Who knows. Now? I think you have to think Ross has jumped to the top of the list in that 2016 rotational battle, maybe even solidifying his spot. Does a rotation of Scherzer, Strasburg, Ross, Gonzalez and Roark sound good? Keep Treinen in the bullpen. Flip spare depth (Cole, Jordan, Hill) for whatever you can get for them, and make room for the next wave of guys (Giolito, Voth, Lopez, Pivetta). Wishful thinking? Perhaps. We love dreaming on pitching prospects here, but give me your thoughts. 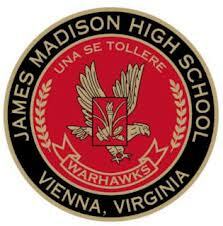 Madison HS is your 2015 Virginia 6-A state champ. DC/MD/VA District High School Tournament Report: Start of the 2015 post-season, which covered MD regionals, VA district brackets, Private school tourney results. Virginia Regional Results, DC Tourneys which mostly covered the Virginia Baseball Regional tournaments. In this post, we will cover the various Player/Teams of the year that have been released, Virginia State tournaments and re-cap MD, DC and private schools. All the Virginia state tourneys ran the weekend of 6/12/15 to 6/13/15. All Virginia state brackets available from this link at VHSL.org. Before we get to the Virginia playoff results, some player of the year and all-area teams have been announced. Maryland: Chopticon’s Ljay Newsome, who pitched the game of his life in the Maryland 3-A championship, won the award in Maryland. He has yet to declare for a college but was drafted (26th round by Seattle). Washington DC: St. John’s A.J. Lee won the award for the 2nd consecutive year. Committed to Maryland. Virginia: The Steward School (Richmond)’s Nic Enright won the award in Virginia. He’s committed to Virginia Tech. Louisville Slugger All-Americans announced; Ljay Newsome and A.J. Lee were named to the first team All-American. The Washington Post’s 2015 All-Met announcement, with mostly familiar names that we’ve discussed in this blog this spring. A.J. Lee was your All-Met player of the year. Cody Morris named to his third straight All-Met team despite his Tommy John surgery. The Baltimore Sun’s 2015 All-Metro Baseball Team. Player of the year is Truman Thomas of Southern (2-time defending Maryland 2-A champ). Ironically Morris was only Baltimore 2nd team. 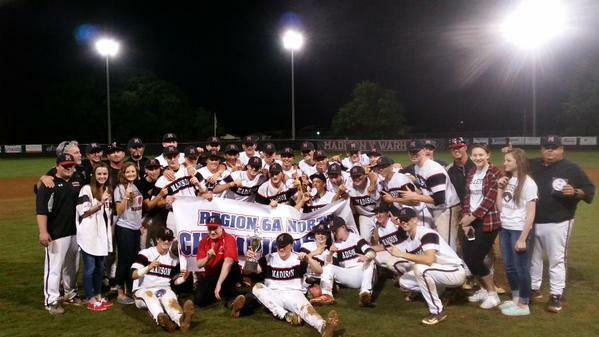 All 2015 6-A North region teams via InsideNova.com. 6-A North player of the year was Oakton’s Joe Rizzo, a *junior* who hit over .600 for the season. He’s an early commit to South Carolina. All 2015 6-A South Region team: co-players of the year Bodie Sheehan, First Colonial, a Lefty committed to William & Mary and Nathan Eaton, Thomas Dale, a SS/RHP committed to VMI. All 5-A North: Marshall HS C Mitch Blackstone (Cornell commit) named the 5-A player of the year (he was also all-Met). All 3-A East: Loudoun Valley’s Jack DeGroat (Liberty) the regional player of the year. Maryland MIAA All-State teams: pending. 6-A State Finals: held at Robinson and Lake Braddock HS in Northern Virginia (which are odd-choices; Robinson and Lake Braddock’s fields aren’t exactly the nicest available fields in the area. Nor do they have the largest stands. But, those are the two biggest high schools around, so perhaps that’s why they were selected. Of course, in previous years Fairfax HS was frequently used, with its ridiculously short LF porch, so maybe Robinson’s larger field is better. Most people believe Madison has one of the nicest HS fields in the area … but it rarely gets selected as a host for some reason when the cycle for hosting comes back to NoVa). 6-A State Semis Results: Madison pecked away at First Colonial and ended up breezing to a 7-2 victory in the first semi. Madison’s senior ace Brian Eckert (Radford commit) pitched 6+ innings of one run ball in his final appearance for the Warhawks. In the nightcap, Chantilly got revenge from last year’s state final and pounded the defending 6-A champ Western Branch 8-3 to make the 6-A state final a rematch of the regional title game and an all-northern Virginia affair. 6-A State Final: In the state final, Madison’s junior lefty Matt Favero started the game … and he finished it. Madison jumped ahead 3-0 but Favero got knocked out in the 4th after giving up 5 hits and 5 unearned runs. Madison clawed their way back though, tying the game in the 6th and then loading the bases in the bottom of the 7th with no outs. There, Favero came up and got the walk-off hit (twitter link to video of the hit) to clinch Madison’s 4th state title (2015, 2002, 1971 and 1968). Kudos to Chantilly; two straight state finals; their coach (Kevin Ford) deserves his coach of the year accolades. Madison’s feat is all the more impressive when looking at their lineup; outside of their ace lefty Eckert and one position player, the rest of their starting lineup in the state tournament are underclassmen. They could be quite dominant in 2016. 6-A State champ: Madison (Vienna) with a 24-5 record on the season. Stone Bridge plays at 3pm at Lake Braddock, Marshall at 7pm. 5-A State Semis Results: As with the 6-A tournament, the 5-A final will be an all-Northern Virginia affair as both local teams won. Stone Bridge’s Brett Kreyer threw a one-hitter as Stone Bridge beat Freeman 6-0 in one semi. Marshall took advantage of an ill-timed error that would have ended an inning and a rally and eventually beat the defending champ’s Hickory 7-4. 5-A State Final: In the state final, Stone Bridge fulfilled its “ewing theory” credentials by getting further without J.B. Bukauskas than they ever did with him, handling Marshall 9-4 for its first state title. 5-A State champ: Stone Bridge with a 23-5 record on the season. 4-A State Finals: held at Liberty University in Lynchburg. 4-A State Semis Results: Glen Allen took out Fauquier in the first state semi final 6-4, facing the Warrenton team after they had to forfeit their 4-A north final victory and settle for second place. In the other semi, Jefferson Forest outlasted two-time defending state champion Hanover 4-3 in extra innings. 4-A State Final: In the final, Glen Allen scored four early and was never threatened, beating Jefferson Forest 9-3. 4-A State champ: Glen Allen (N. Richmond) with a 23-3 record on the season. 3-A State Finals: held at Liberty University in Lynchburg. 3-A East: Winner Loudoun Valley (Purcelville) (22-2), Runner-up Lafayette (Williamsburg) (18-6-1) (note: these teams were declared co-champs; the positions must have been determined by a coin-flip). 3-A State Semis Results: In the first semi, Loudoun Valley upended Rustberg 6-0 with Liberty commit Jack DeGroat throwing a complete game 2-hitter with 17 strikeouts. On the other side, Lafayette destroyed Monticello 11-0 to setup the state final that should have been the regional final. 3-A State Final: In the state final, Lafayette hit a solo homer for the winning run in the top of the 7th before closing out Purcellville’s Loudoun Valley 5-4 for Lafayette’s first ever state baseball title. 3-A State champ: Lafayette (Williamsburg) with a 20-6-1 record on the season. Smaller Classifications: held in Salem and at Radford University. 2-A match-ups: Strasburg (corner of I-66 & I-81) (25-1) vs Lebanon (SW corner of Virginia), Virginia High (Bristow) (24-2) vs Maggie Walker (Downtown Richmond). In the semis, Virginia High ended Maggie Walter’s season 8-3, and Lebanon ended Strasburg’s excellent season 8-2. In the 2-A West rematch for the state title, Virginia High bashed their way to a 16-8 victory to repeat as Virginia 2-A champs..
1-A match-ups: Honaker (SW corner of Virginia) v Lancaster (King George peninsula), William Campbell (Gladys south of Lynchburg) vs Radford. In the semis, the two 1-A east teams advanced for a rematch, wherein William Campbell turned the tables on Lancaster, winning the 1-A title 16-4. Recent Virginia HS champs: Before 2014, we just covered AAA, which now is split between 4-A, 5-A and 6-A divisions. In the smaller classifications, Loudoun Valley (Purcellville) won 3-A, Virginia High (Bristol) won 2-A and Northumberland (Heathesville, on the King George peninsula) won 1-A. 2013 AAA: Hanover d Great Bridge. Hanover’s super-junior Derek Casey (now at UVA) outlasts Great Bridge and their 1st round talent Connor Jones (now UVA’s Friday starter after spurning a likely late 1st round draft position). Lake Braddock and Oakton beaten in the semis. 2012 AAA: Lake Braddock d Kellam 4-0. Lake Braddock lost to West Springfield in the regional title game but then blitzed to a state championship. 2011 AAA: Great Bridge d South County in the state final, giving the powerful South County its first and only loss on the season after starting the season 28-0. Lake Braddock was the regional finalist and lost to Great Bridge in the state quarters. 2010 AAA: West Springfield d Woodbridge in the final, giving Woodbridge its only loss on the year. WT Woodson regional finalist. Complete history of Virginia HS Champions: from VHSL’s website. Covers all sports and has results for a century. See previous post for MD state final wrap-ups. Brackets here at the MPSAA website. 3-A: 2015: Chopticon beat Mt. Hebron 1-0. 2014: Reservoir beat North Harford 2-0. 2013: Bel Air defeated La Plata 3-2. 2012: Bennett. 2011: Bennett. 2010: C. Milton Wright. 2-A: 2015: Southern beat Eastern Tech 6-1. 2014: Southern beat Parkside 3-2. 2013 : Catoctin defeated North Caroline, 4-2. 2012: Williamsport. 2011: North Caroline. 2010: North Hagerstown. 1-A: 2015: Brunswick beat McDonough 4-0. 2014: Smithsburg beat Sparrows Point 9-0. 2013: Cambridge/South Dorchester defeated Allegany, 15-0. 2012: Mountain Ridge. 2011: St. Michaels. 2010: St. Michaels. DCIAA: Wilson won its 23rd consecutive DCIAA regular season title, extending its city league winning streak in the process. DCIAA tournament supposedly ran through 6/3/15, though I cannot find any evidence that it occurred. Perhaps it has been replaced in total by the DCSAA tourney. DCSAA: In the DCSAA final, Gonzaga beat St. Albans 2-1 at Nats Park on a controversial interference call that turned a tag-out at the plate into the decisive run. MIAA: Class A: Spalding beat Calvert Hill. Class B: St. Mary’s-Annapolis. Class C: St. John’s Catholic Prep repeated. VISAA: Liberty Christian repeated as the VISAA Division 1 champ. Greenbriar Christian took the Division 2 title and the Southampton Academy took the Division 3 title among smaller Virginia private schools. WCAC: St. Johns (DC) topped DeMatha in a 3-game series to win the WCAC for the 2nd year in a row. (Not the same St. Johns as who won MIAA). IAC: Georgetown Prep beat Landon to win the IAC, avenging their loss in the finals last year. PVAC: Sandy Spring Friends defeated Jewish Day school for the inaugural title in this fledgling league. MAC: the Potomac school beat St. James (who upset #1 seed and defending champ Flint Hill) in the final. Maryland Private School Tournament: DeMatha beat Riverdale Baptist. All local area Private schools’ seasons are now complete. Washington Post All Met Sports Final Baseball top 10: Updated/finalized 6/17/15 at the end of the spring prep season. Madison 1, Gaithersburg 2. If I had ranked them, I likely would have gone Madison 1, Gaithersburg 2, Spalding 3, Stone Bridge 4, Chopticon 5, Chantilly 6, Loudoun Valley 7, St. Johns 8, Oakton 9 and Marshall 10. Battlefield HM. I was pretty close. Baltimore Sun Final Rankings page : dated 5/25/15: They also have Spalding #1, then Calvert Hall, St. Marys, 4-A finalist Severna Park and then 3-A finalist Mt. Hebron. Reservoir 6th. Hampton Roads Baseball top 10 page: dated 5/19/15: Western Branch #1, then Grassfield, Hickory and First Colonial. Needs updating. Baseball America’s High School top 50 (Final ranking 6/17/15): Madison #24 in final poll, Stone Bridge #42. USA Today High School top 25 (most recent ranking 6/17/15): Madison at #36, Liberty Christian #43, Spalding #44 and Western Branch #49. MaxPreps top 25/top 50 lists, which has a hand-picked and a computer/power ranking list. 6/15/15 rankings. No DC/MD/VA teams in MaxPrep’s “Excellent 50.” Highest ranked teams in the extended rankings are Liberty Christian at #71, Chopticon at #95. Madison is in the #400s, making one question these rankings slightly. 2015 Draft Results: local player interest draft results. Here’s how some of the players of local interest fared in the 2015 draft. Per section, i’ve ordered these guys by the order they were taken chronologically, not by any pre-draft rankings. At the beginning of the season, we profiled a ton of local prep and college players. And then we talked about the higher-profile local players in our Pre-draft coverage. At the end of the day, almost none of the prep guys were drafted and those that were are almost certain to go to school. Nathan Kirby LHP from UVA: went #40 (Supp 1st round) to Seattle, a huge drop from where he was projected. His injury and the drop in his stuff this year really hurt his draft status. Josh Sborz, RHP closer for UVA: went #74 (Supp 2nd round) to the Dodgers, who had a fantastic draft picking big-name college arms who fell due to performance. Sborz can start (and did start both this year and last). Taylor Clarke, who hails from Ashburn (Broad Run HS) went #76, first pick of the 3rd round to Arizona. Mike Matuella, of Great Falls (Georgetown Prep) and Duke: went two picks later, #78, to Texas in the 3rd round. An amazing drop for Matuella, who was rumored as a top 5 pick earlier in the season but who dropped probably 3 full rounds thanks to the surgery and questions about his medicals. And there’s no reason for him to head back to school; thanks to the timing he isn’t even back on a mound until midway through his senior year. Maybe he does go back to school (he’s going to Duke after all; he may want to finish his degree) and try to get himself back into the 1st round. We’ll see. Brandon Lowe: UMD infielder: 3rd round #87 overall to Tampa Bay. Alex Robinson: UMD’s ace Lefty went in the 5th round (#140 overall) to Minnesota. Joe McCarthy, OF for UVA: 5th round, #148 overall to Tampa Bay. Man, Joe had a rough junior year. He went from a back-0f-the-first rounder to a 5th rounder. Will he hold out for above slot money as a result, possibly going back to school for his Senior year to regain value? I would. Brandon Waddell UVA Saturday/Sunday starter: 5th round (#157) to Pittsburgh. Another guy who was supposed to be higher but who dropped. Jack Wynkoop of Virginia Beach (Cape Henry Collegiate HS), LHP starter for South Carolina: went in the 6th round to Colorado. Michael Boyle: Radford Ace. 13th rounder to the Dodgers, who just *cleaned up* on high-profile college arms in this draft. Kevin Mooney: UMD closer: 15th rounder by the Nats! Kenny Towns; 3B from UVA and the 2011 All-Met player of the year from Lake Braddock, went in the 20th to the Angels. Luke Willis, OF from George Mason and Oakton HS, in the 30th round to Kansas City. 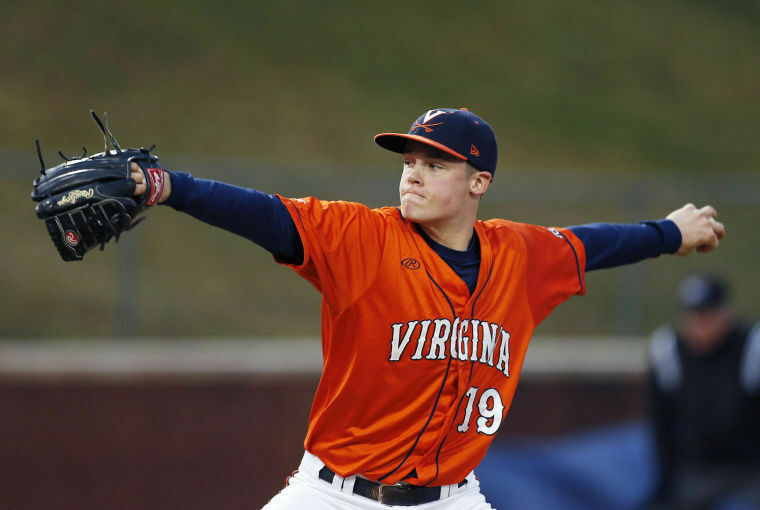 There are quite a few other college players from the many baseball-playing colleges in the area drafted past the 10th round; search the MLB draft tracker and select the state of Virginia for many more local college players. Local Prep players of note: nobody got drafted high enough to seriously consider changing their college frankly. Jimmy Barnes, Deep Creek HS in Chesapeake; 11th rounder to the Angels. Interesting selection; the 11th round is the first round where you can “get away” from the bonus structure of the first 10; Barnes hasn’t committed to a college and is a SS from the baseball hotbed of Chesapeake VA. Signable? Nic Enright of Steward HS in Richmond: 19th rounder to the Mets. Looks like he’s going to Virginia Tech. Ljay Newsome of Chopticon (south of Waldorf): 26th rounder by Seattle. Wonder what happens here: Newsome has not declared for a college yet. Is he signable as a 26th rounder? Post Publishing update: per his summer team’s twitter page, Newsome signed. Nathan Trevillian, RHP from small Amherst County HS; committed to Liberty. 22nd rounder to the Mets. Stevie Mangrum, 3B from Western Albemarle HS in Charlottesville. Va Tech commit, 28th round pick by Boston. Cody Morris, of Reservoir with a South Carolina commit and a TJ surgery: got picked up in 32nd round by Baltimore, probably the team sending a message to a local kid. Hunter Parsons of Parkside HS, picked up in the 40th round by Cleveland. Maryland commit. Andrew Suarez , (2nd round pick 2014) LHP from Miami went in the 2nd round again, #61 overall this time to San Francisco. A few picks after he went last year; did he make a mistake spurning the Nats offer? (disclaimer: who knows what the Nats offered). Skye Bolt, OF from UNC, went in the 4th round (#128 overall) to Oakland. Cody Poteet, (27th rounder in 2012) went in the 4th round (#116 overall) to Miami. Austin Byler, (9th rounder, 2014) OF from Nevada. Was the first pick on day 3; 11th rounder by Arizona. His decision to head back to school may have cost him (though, to be fair, we have no idea what he turned down from the Nats). Daniel Salters (22nd rounder 2014) C from Dallas Baptist: 13th round pick to Cleveland in 2015. Jake Jefferies (34th rounder in 2012): 2B from Cal State-Fullerton; Nats picked him up again, this time in the 39th round. He’s a junior now, clearly the Nats like him and probably just wanted to send a message, setting him up for next year. There’s a couple more guys who were HS draftees in 2012 who should be draft eligible juniors now but who were not drafted. They may not even still be playing for all we know. As we did for the 2013 draft, and again in 2014, here’s a quick introduction to the Nats top 10 picks for 2015. Here’s a slew of Draft Prospect rankings that I’ll refer to later on. As he did last year, NatsGM.com‘s Ryan Sullivan live-blogged the draft and does a great job of pulling up stats and observations on each pick. Baseball America’s Draft Database for 2015; this will get updated with bonus amounts when the players sign. 1st round/#26 overall: in what would have been the Nationals first round pick had they not signed Max Scherzer and forfeited their pick, the Los Angeles Angels went way off-board and picked Taylor Ward, a Catcher from Fresno State. He’s not even in Keith Law’s top 100 and is mostly in the 75-100 range of other ranking services, and players like Mike Nikorak, John Harris, Kyle Funkhouser, Daz Cameron and Mike Matuella (a Nationals special; a big righty with power and a Tommy John surgery) still on the board. Unlike two years ago when I complained bitterly about the loss of the 1st rounder, here Scherzer is more than proving his worth and I’m not as worried about the loss of this pick in a weak draft. But I wouldn’t have minded seeing how Harris or Funkhouser worked out. 2nd round/#57 overall: Andrew Stevenson, Jr. OF (CF) from LSU (hometown Youngsville, LA). Rankings: Law outside #100, MLB #79, BA #168, Sickels #101, Draft Rpt #115. 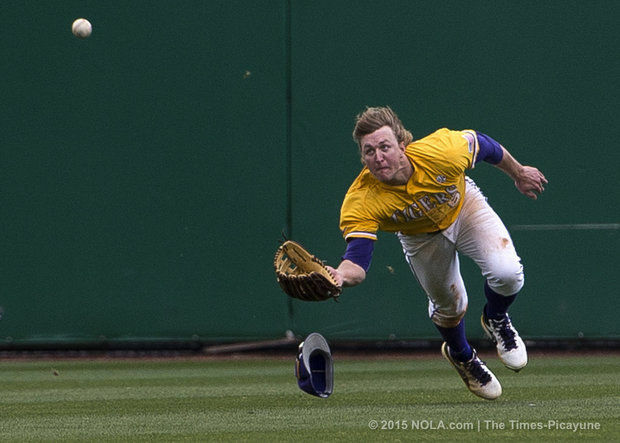 A slightly built slap hitter who plays excellent CF for LSU but, from my limited observations, looks like he’s destined to be a spare outfielder at best. More than one of the above draft guides mentioned Ben Revere as a comparison. (This was the comp pick for last year’s non-signing of Andrew Suarez … who went 4 picks later). FWIW, Law said he “fell out of his chair” when he saw the Nats taking him here. I can only surmise what the team sees here; perhaps they got a deal on him and will apply some of the savings down the road. 2nd round/#69 overall: Blake Perkins, Prep OF (CF) from Verrado AZ HS (hometown: Phoenix, AZ). Rankings: Law #96, MLB #162, BA #137, Sickels #148, Draft Rpt #283. Perkins profiles similarly to Stevenson: slight build, very fast, great fielder, decent arm and a questionable hit tool. He’s committed to Arizona State and hails from the Phoenix suburbs. For what its worth, in Keith Law’s post-round 2 write-up, he specifically called out this pick as being a very good one. But, he’s still *way* overdrafted according to most of the rankings. 3rd Round/#103 overall: Rhett Wiseman, Jr. OF (corner) from Vanderbilt (Hometown Mansfield, MA). Rankings: Law outside #100, MLB #120, BA #88, Sickels #92, Draft Rpt #146. Developed big-time power his junior year at Vanderbilt. Probably projects as a LF but is no bigger than the CF draftees the Nats already have picked. 4th round/#134 overall: Mariano Rivera, JR, Jr. RHP (starter) from Iona (Hometown Harrison NY by way of the D.R.) Rankings: Law #93, MLB #170, BA #142, Sickels #215, Draft Rp #198. Well, you can’t argue with the pedigree. He’s stepped it up this year as a junior with a huge velocity spike and *will* sign, but he barely weighs more than my labrador and one wonders if he can withstand the rigors if pitching in the pros. Very little mileage on the arm (he didn’t pitch until he got to college reportedly). Interesting pick. 5th round/#164 overall: Taylor Hearn, Jr. LHP starter from Oklahoma Baptist (Hometown Royse City, TX). Rankings: … well, nobody ranked this kid. Not even on the top 500 prospect list. He was 9-0 for the NAIA team with good K/9 rates. Not much else to be said. The Nats have drafted twice before players from this school (Richie Mirowski and Matthew Page) with decent success and clearly have a scout working that area with success. Is this a signability/money saving pick? But for whom? Perkins? 6th round/#194 overall: Matt Crownover, Jr. LHP starter from Clemson (Hometown: Ringgold, Ga.). Rankings: BA #344, Draft Rpt #161. Great numbers at Clemson: 10-3 with a 1.82 ERA. Tommy John survivor, undersized. Perhaps projects as a future reliever. 7th round/ #224 overall: Grant Borne, Jr. LHP starter from Nichols State (Hometown: Baton Rouge, LA). BA #348, otherwise unranked. Another mystery player. 6-5 with a 1.48 ERA as a starter for Nichols State. 8th round/#254 overall: Koda Glover, Sr. RHP Oklahoma State (Hometown: Heavener, OK). Sickels #297, otherwise unranked. Glover was a back-end reliever for Oklahoma State, having transferred in after two years at Juco. MLB says he’s a senior, OK State says he’s a junior. Either way, he’s a reliever who could be quicker to the majors, which isn’t too bad a pick for the 8th round. 9th round/#284 overall: David Kerian, Sr. switch hitting 1B from Illinois (Hometown: Dakota Dunes, SD). He hit .366 with 14 homers on the year for one of the best teams in the country. Not a bad pick. 10th round/#314 overall: Taylor Guilbeau, Sr lefty starter from Alabama (Hometown Slaughter, LA): nice sign here, getting a Friday starter in the SEC. 3-6 with a 3.69 ERA on his senior season, which ended in the SEC playoffs for Alabama this year. Three outfielders, two definite CFs and one corner OF. His first three picks were outfielders … then 6 of the next 7 were arms. Mostly left-handed college starters. How many of these starters will profile as pro relievers? Probabaly a few of them; Rivera for sure, likely Crownover, probably Guilbeau as well. Well, Rizzo likes college grads, and this shows it. ONE prep player out of his first 10 picks. Its amazing to me, year after year we seem to see this. The Nats draft so heavily from the southeast and midwest. Meanwhile, everyone knows that the two best states for prospects are California and Florida. If you look at the home towns of these top 10 picks, still nobody from the two major baseball states and just one guy who hails from Texas. I guess Rizzo really trusts his area scouts down there. Well, like in 2013 when you don’t have a 1st round pick … you’re not likely to end up with a name that you’ve heard in the pre-draft coverage. And I hadn’t heard of practically any of these guys prior to seeing their names read. Picks 8-10 seem like typical low-value senior signs, but you have to wonder where the draft bonus dollars are going here. Is everyone signing for slot? Are there any risky picks here? Here’s how the super-regionals went down: we’ll look at these regionals in the original order of the top 8 national seeds. Red indicates the winner. Maryland at UVA: UVA scored 5 runs in the 8th off Maryland’s closer Kevin Mooney to shock the Terps in Game 1. Connor Jones gave up 3 in 7 innings and was wild, and Maryland Ace Mike Shawayrn pitched into the 8th before getting lifted. Game two was even more of a shock, with UVA scoring 3 in the ninth to get a walk-off win 5-4, again with the winning hit coming against Mooney. UVA’s starter Brandon Waddell gave up 4 in 8 innings and local product Alec Bettinger got the win with a scoreless 9th. Poor Mooney; just about the two worst outings of the season for him at the worst possible time (he had a 1.89 ERA on the season). UVA advances to the CWS for the 2nd straight year. #2 LSU vs Louisiana-Lafayette: LSUand ULL had late drama, each team hitting a homer in the 9th, except that LSU’s was a walk-off, giving them game one 4-3. In the second, LSU controlled the game and won the series 2-0 to advance to Omaha. Draft prospects of note Alex Bregman and Blake Trahan were both relatively quiet in the first game but Bregman came up big in the 2nd game. #3 Louisville vs #14 Cal State-Fullerton: CSF stole the first game, outlasting Louisville’s Ace Kyle Funkhouser (who gave up 2 in 7) and, after giving up a game-tying solo homer in the bottom of the 9th worked the bases loaded and won on a go-ahead HBP. Louisville pounded CSF 9-3 in game to to force a Monday decider. They needed extras, with Cal State-Fullerton scoring 2 late to force it and then taking it 4-3 with a run in the 11th to advance. #4 Florida vs #13 Florida State: Florida scored 4 in the first and never looked back, winning game one 13-5. They didn’t let up in game two, winning 11-4 and sending Florida to the CWS. #5 Miami vs VCU: Miami took game one 3-2 partly thanks to an egregiously bad runner interference call in the middle of a VCU rally. And then Miami became the first to punch their ticket to Omaha with an easy game 2 win, barely looking taxed by the over-matched VCU Rams. #6 Illinois vs #11 Vanderbilt: in game 1, Vanderbilt destroyed Illinois 13-0; Carson Fulmer went 6 1/3 scoreless and Vanderbilt pounded Illinois’ ace Kevin Duchene (giving him just his 2nd loss this year). In game 2, Illinois super-reliever and 1st round pick got the start, and got hit. In fact, the biggest guy to get to him was #1 overall pick Dansby Swanson, who came up huge in this game and helped Vanderbilt win 4-2 and advance to Omaha as the defending champ. #7 TCU vs #10 Texas A&M: TCU blitzed the offensive-minded TAMU team 13-4 in game one, handing TAMU starter Grayson Long his first loss of the season. TAMU got to TCU starter Preston Morrison in the 10th and won 2-1 to force the third game. That 3rd game was an instant classic, with TAMU scoring 2 in the 9th to tie it, and the game going 16 innings. TCU’s Mitchell Traver pitched 4 hitless innings and got the win with TCU‘s walkoff in the bottom of the 16th. #8 Missouri State at Arkansas: Arkansas got to host this series thanks to Missouri State’s co-tenant (the AA affiliate of St. Louis) having a home series. This did not bode well for MSU, and neither did their Ace and top-10 draft prospect Jon Harris getting absolutely lit up in game 1; he gave up 9 runs in 5 innings and the bullpen didn’t do much better, with Miami winning 18-3. Harris may have cost himself some cash with that last look for some scouts. In game 2, Missouri State forced the sunday decider with a 3-1 victory. In the decider, Arkansas scored 3 in the first and made it stand up, winning 3-2 and advancing to Omaha. Other players of note: Arkansas’ presumed first rounder Anthony Benintendi was mostly pitched around in game one (3 walks) and was basically a non-factor the rest of the way. LSU, TCU, Vanderbilt and Cal State-Fullerton on the other. 2 ACC, 4 SEC teams, one Big-12 and one Big West entry. Very much an East Coast tournament this year; the two non ACC/SEC teams had to beat (favored) ACC/SEC teams to advance. Four national seeds remain (#2, #4, #5 and #7), two regional host seeds are in (#11 and #14) and those teams that are not seeded (UVA and Arkansas) have pretty good pedigrees. A great field. CWS Field thoughts; I think the “left” side of the draw will come down to Miami and Florida, and I think Florida is too tough. If UVA gets Nathan Kirby back they could be interesting, but I don’t think they have the offensive firepower to match up. On the right hand side of the draw, LSU remains the highest seeded team left but has to contend with one other national seed in TCU. Nonetheless, I think the right side comes down to SEC rivals LSU and Vanderbilt (the two SEC divisional regular season winners) with LSU taking it. Quick predictions: Florida versus LSU in the final, with LSU winning it. Player Star power in this CWS: Lots of it; these CWS teams are littered up and down with big time names. Playing this upcoming weekend are 1st-day draftees Dansby Swanson, Walker Buehler, Carson Fulmer from Vanderbilt, Alex Bregman and Andrew Stevenson from LSU, Nathan Kirby and Josh Sborz from UVA, Andrew Benintendi from Arkansas, Andrew Suarez from Miami, Richie Martin from Florida, Alex Young and Tyler Alexander from TCU, and Thomas Eshelman from Cal State – Fullerton. All 8 teams have at least one first or second rounder. DC/MD/VA District High School Tournament Report: 2015 post-season, which covered MD regionals, VA district brackets, Private school tourney results. In this post, we will cover the Virginia Regional results, preview the VA State brackets, finish up the DC tourney results, and have summaries to the Maryland and Private school results. All regional brackets are available at this link; we won’t keep reposting links below. My predictions: Oakton and Madison on one side, Patriot and Chantilly on the other. Most of the expected Northern Region heavyweights are here and it should be a good tourney. In the 6-A North Regional first round on 5/29/15, there were plenty of upsets. South Lakes shut out Potomac champ Lake Braddock and Centreville easily handled Cedar Run champion Patriot 11-5, eliminating two district champions. The other two district champs (Madison and Chantilly) each advanced easily in the first round, with Madison throwing their ace lefty Brian Eckert (Radford commit). Battlefield blanked Oakton 7-0 as Jake Agnos (East Carolina commit) picked right back up where he left off in his 21-K start, whiffing 13 through 6 innings and eliminating the team I thought might very well win the Region. Liberty regular season champ McLean was trounced by South County 9-1, completing the penalty for their early-district tournament defeat. In the 6-A North Regional Quarter finals on 6/1/15, Battlefield eased by South Lakes 8-2 and Chantilly handled South County 7-5. Rain wreaked havoc in the area the evening of 6/1/15 so some of these teams may have to play back to back games this week. Indeed, the other two games got pushed to 6/2/15; Centreville continued its upset ways by beating West Springfield 10-5 and Madison blasted Herndon 21-3. This sets up two interesting Regional semi finals: Centreville and Chantilly are local rivals, while Battlefield & Madison met in the semis of a tournament in Myrtle Beach earlier this year and Madison won handily 11-1. In the 6-A North Regional semis on 6/3/15, Madison and Battlefield faced off for the 2nd time this year, but this time with both team’s throwing their aces. Battlefield’s Agnos threw 8 innings, struck out 14 and gave up 1 unearned run to finish an amazing post-season, but he was matched by Madison’s Eckert. The game went to the 9th. After having struck out the side in the top half of the inning with runners on 2nd and 3rd, Madison’s Pete Nielsen hit a walk-off single to win it for Madison and send them to the Regional final and state 6-A tournament. On the other side, Chantilly beat Centreville 8-4 to return to both the Regional final and the 6-A state tournament for the 2nd year in a row. Just a note on Agnos before moving on: in his final three starts (in the district final and his two regional starts) he threw 21 innings and struck out FOURTY-EIGHT batters. I’ve never heard of such a feat; its amazing to me that he’s “only” just going to ECU and isn’t more prominently mentioned in the draft. In the 6-A North Regional final on 6/5/15, coach Mark “Pudge” Gjormand’s Madison jumped out to a 5-0 lead early behind a 3-run homer from starting pitcher Matt Favero (who took a no-hitter into the 6th) and cruised to a 9-0 laugher in the regional final over Chantilly. Next up for both teams is the 6-A state semi-finals. In the 6-A South Regional quarters, all four District champions advanced, mostly with ease. Cosby beat Colonial Forge in a 2-1 squeaker, Western Branch pounded Cox, First Colonial eased by Grassfield (in what might have been an upset in reality), and Forest Park beat Thomas Dale. In the 6-A South Regional semis, First Colonial ended Forest Park’s season 4-3. Rain wreaked havoc on the 6-A south playoffs, with the Cosby/Western Branch semi rained out two nights in a row, forcing a push of the regional final. When they finally played, Western Branch handled the Richmond power easily 8-2 to advance to the state tournament. In the 6-A South Regional final, Western Branch beat First Colonial 2-1 in a tidewater battle. In the 5-A North Regional first round on 5/29/15, all three conference 13 teams playing lost (Edison, Stuart and Lee), indicating just how weak that conference was this year. Conference 15’s #2 seed Potomac handled Briar Woods. In the 5-A North Regional Quarter finals on 6/1/15 and 6/2/15, #1 seeds prevailed as Marshall, Stone Bridge, Mountain View and Patrick Henry-Ashland all advanced. In the 5-A North Regional semis on 6/3/15, Stone Bridge beat Mountain View (Stafford) 4-1 to return to the regional final/state tourney for the second year. Their opponent will have to have played back-to-back games, as the Patrick Henry-Broad Run quarter was postponed two days in a row, backing up that part of the draw. Stone Bridge outlasted Patrick Henry 3-2, setting up a final of Northern Virginia’s two best 5-A teams this year on Marshall’s home field. In the 5-A North Regional final on 6/6/15, Stone Bridge won their second straight 5-A north title by beating Marshall on their home turf 10-7. Lots of new faces in this regional … and two familiar ones. Hickory beat Freeman in last year’s 5-A state final and could meet again in the regional final. But Hickory would have to go through Kellam, a traditional powerhouse. In the 5-A South Regional quarters, rain forced the whole slate to 6/3 or 6/4, backing up the tournament badly. Menchville (Newport News) upset Kellam 4-2 (though by their records it wasn’t much of an upset), Hickory advanced over Princess Anne easily 12-1. The other two quarters were rained out *three days in a row* unbelievably, forcing the whole slate of the 5-A south tournament to shift. In the 5-A South Regional semis, Hickory topped Menchville 7-4. Clover Hill defeated Freeman in 10 innings … but was then forced to forfeit the game due to their using an ineligible pitcher. 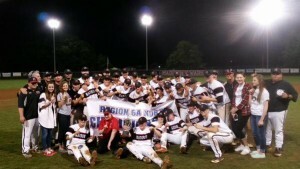 In the 5-A South Regional final, Hickory took advantage of a tired Freeman team (a rematch of last year’s 5-A title game) and won the regional title. Virginia Smaller Classifications: we’ll just summarize the regional finalists who are moving on to the state tournament. 4-A North: All four district champs advanced the semis. Jefferson Forest (Lynchburg) and Fauquier HS advanced to the final, and Fauquier won it. 4-A South: Upsets abounded as Powhattan and Hanover upset district champs in the quarters. North Richmond suburb rivals Glen Allen and Hanover (both from District 20) advanced to the regional finals, where Glen Allen beat the 2-time defending state champs again 15-4 for the regional title. 3-A East; Loudoun Valley’s Jack DeGroat (committed to Liberty) threw a no-hitter in the 3-A East regional quarters over Culpepper. Loudoun Valley advanced to the final, facing Lafayette from Williamsburg. I guess they got rained out so many days in a row that they declared co-champions. 3-A West: All four district champs advanced the semis. There, Rustberg and Monticello advanced to the finals, won by Monticello. 2-A East: Both local teams (Strasburg and George Mason) advanced to the Region semis. George Mason’s season came to an end at the hands of Va Beach-based Maggie Walker, but Strasburg continued their recent dominance by winning the regional. 2-A West: Virginia High and Lebanon advanced to the regional finals; Virginia High wins it. 1-A: No DC-local schools are in the smallest 1-A classification. All the state tourneys run from June 12th – 13th at the various sites. Semis are at 3pm and 7pm on 6/12/15 and the finals are the next day (though it seems that some of these teams have graduation ceremonies this coming weekend, so the dates/times are in flux). All state brackets available from this link at VHSL. 5A – Lake Braddock HS for semis, Robinson for the final. 4A – Liberty University, Lynchburg for both semis and final. 3A – Liberty University, Lynchburg for both semis and final. 2A – Radford University semis and final. Here’s the state matchups (? means the regional final results were still pending upon publish; we’ll update as we get them). 2013: Hanover d Great Bridge. Hanover’s super-junior Derek Casey (committed to UVA) outlasts Great Bridge and their 1st round talent Connor Jones (now attending UVA after spurning a likely late 1st round draft position). Lake Braddock and Oakton beaten in the semis. 2012: Lake Braddock d Kellam 4-0. Lake Braddock lost to West Springfield in the regional title game but then blitzed to a state championship. 2011: Great Bridge d South County in the state final, giving the powerful South County its first and only loss on the season after starting the season 28-0. Lake Braddock was the regional finalist and lost to Great Bridge in the state quarters. 2010: West Springfield d Woodbridge in the final, giving Woodbridge its only loss on the year. WT Woodson regional finalist. DCIAA: Wilson won its 23rd consecutive DCIAA regular season title, extending its city league winning streak in the process. DCIAA tournament runs through 6/3/15. DCSAA: the 2015 tournament is underway, with the final scheduled for Nats park on 5/31/15. Gonzaga is the #1 seed and Wilson the #2. Curiously missing is St. Johns, who won the WCAC and is the defending DCSAA champ. In the semis St. Albans upset Wilson to setup a final against Gonzaga. In that final, Gonzaga beat St. Albans 2-1 at Nats Park on a controversial interference call that turned a tag-out at the plate into the decisive run. Maryland: Chopticon’s Ljay Newsome, who pitched the game of his life in the Maryland 3-A championship, won the award in Maryland. He has yet to declare for a college. Washington Post All Met Sports latest Baseball top 10:: Spalding, Gaithersburg 1-2, then Oakton, Madison, and Battlefield. Stone Bridge 8th despite a win over Madison in Vienna. This hasn’t been updated for regional and state tournaments; i’d guess we’d see Madison and Stone Bridge rise slightly but likely not overtake Maryland’s two best teams unless they win states. Baltimore Sun Rankings page : dated 5/25/15: They also have Spalding #1, then Calvert Hall, St. Marys, 4-A finalist Severna Park and then 3-A finalist Mt. Hebron. Reservoir 6th. Hampton Roads Baseball top 10 page: dated 5/19/15: Western Branch #1, then Grassfield & Hickory. Baseball America’s High School top 25 (most recent ranking 6/2/15): no DC/MD/VA teams listed. USA Today High School top 25 (most recent ranking 5/20/15): Western Branch closest to top-25, ranked 26th. Spalding (both Washington Post’s and Baltimore Sun’s #1 team) ranked 42nd nationally. USA Today’s Virginia-only rankings: no longer seem to be in existence. MaxPreps top 25/top 50 lists, which has a hand-picked and a computer/power ranking list. 5/24/15 rankings. No DC/MD/VA teams in MaxPrep’s “Excellent 50.” Highest ranked teams in the area are Liberty Christina (#55), Western Branch (#67), Turner Ashby (#72). Chopticon and Spalding are in the 75-100 range. Faquier Times (Fauquier) has some local sports news.